Yesterday I had a really great shopping trip, bringing home a bunch of produce for very little money. Much as I love a good deal on produce, bringing home that much at once does mean that I need to figure out what to do with it all so it doesn't spoil and gets the most use. Here's what I did with the produce I brought home yesterday. Of course there is still much more fresh in my fridge to use up at later dates, but this is the food prep I did for now. All the bananas got peeled and frozen to be used for smoothies or other desserts at another time. Strawberries were frozen for use in desserts and smoothies. 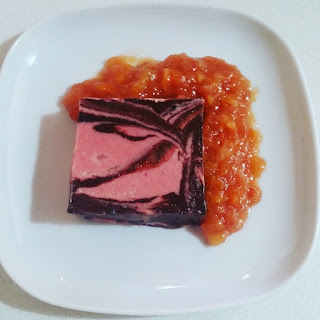 I made a strawberry and chocolate swirled vegan paleo ice cream. I made a peach sauce to serve with the ice cream. I plan on making a strawberry vinaigrette with some strawberries. I gave my children watermelon to snack on. I blended up more watermelon with vinegar, garlic, onion, basil, olive oil, and salt, to make a delicious watermelon gazpacho or chilled soup. Other watermelon got blended up together with some apples that were on their last legs, and are currently in the oven drying to become fruit leather. For my 30 lbs of artichoke, it was a challenge to figure out what to do. I'd only ever boiled or baked artichoke whole, or used frozen artichoke hearts to stuff. I wanted to figure out how to turn my massive amount of artichokes into usable vegetables other than just boiling. I did a lot of research and finally figured it out. But of course, to start with, I boiled a bunch of whole artichokes, which we'll eat with a vegan hollandaise sauce. To get usable hearts, I read that you should go around the artichoke pulling off leaf by leaf, until they are all off, and the inner choke is exposed. You then use a spoon or melon baller to remove all the choke. Then you use a knife to trim the outside of the artichoke heart, and I really didn't know what that meant but figured I'd just cut off anything that is bright green and fibrous looking and just expose what is underneath, and that seemed to have worked well. So I did that with a bunch of artichoke, and I saved up a gigantic pot full of those leaves I removed, and boiled them up. I will either eat them as is, or see if I can use them to make into a dip. I made stuffed artichoke hearts with beef and lemon and mint which was absolutely delicious. I made a great soup using leek, zucchini scraps, some fennel that was about to go off, and artichoke hearts, and blended it up. Delicious! 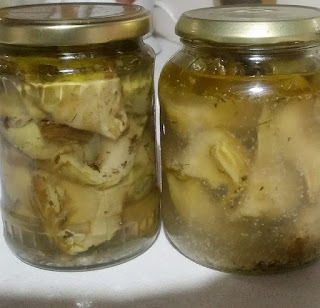 I checked on a bunch of websites how to make marinated artichokes and had a hard time figuring out exactly what to do, but eventually I managed to figure it out. This time instead of taking off all the leaves, I just took off all the outer leaves, but as soon as the texture of the leaves changed, and they became the thinner inner leaves, I just trimmed them but left them attached to the heart. I cut the artichoke in half and used a spoon to remove all the choke, and then trimmed the heart, leaving the leaves attached still. Once I did that, I halved them again (so it was all in quarters) and boiled them for about 10 minutes or until they were tender enough to be able to stick a fork in them. 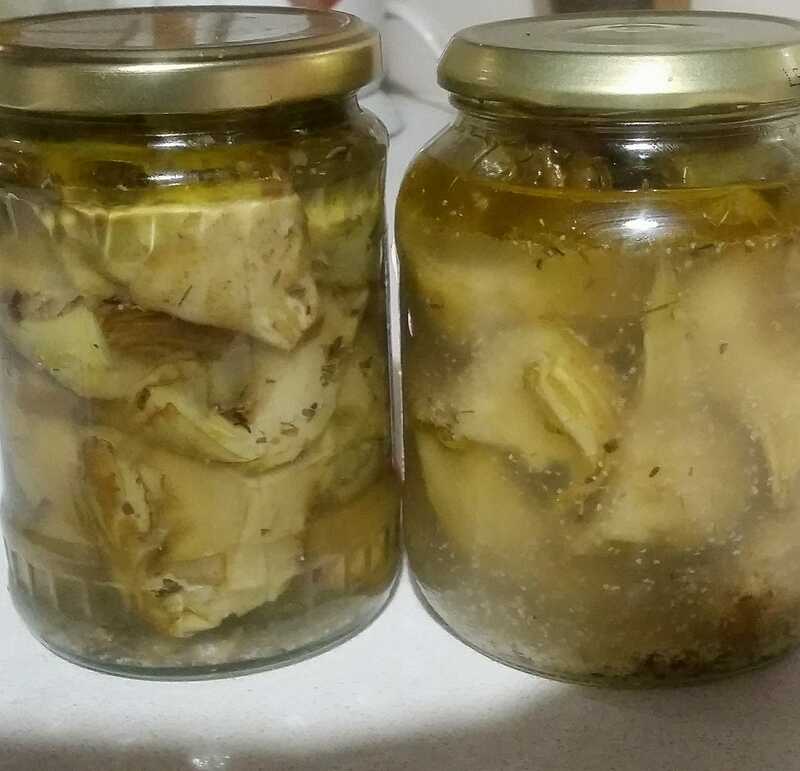 I then packed them into jars, and brought a mixture of vinegar, lemon juice, water, salt and herbs to a boil, then poured it onto the artichokes in the jars. I topped them off with olive oil and then let them cool. Already they taste delicious! I turned a bunch of cucumbers into Korean cucumber salad. Yes, today was certainly a day of cooking marathons, but the food that I made came out so terrific, and now I don't have to stress out about the food going off, or getting bored by having the same food over and over. 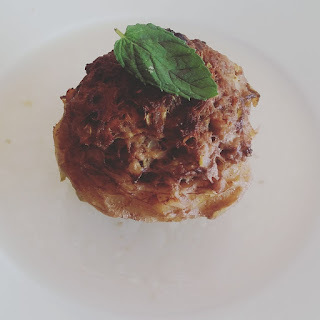 What I made feels like special food, fancy food, and it makes me really happy that I'm able to make that kind of food frugally. My way of having my cake and eating it too! What are your favorite artichoke recipes? Strawberry recipes? Watermelon recipes? Any of the things I made things you'd also like to make, and would like recipes for? Yes please! the strawb choc ice cream recipe. But only if it doesn't use rich whip which I can't eat. tnx! What a haul, tho. Reminds me of me when my kids were small. I'd spend all June cooking up huge batches of food, predominantly main courses, just so that over "khom-yuli-august" I wouldn't have to toil in a kitchen with no a/c! That's the way to go! Haha if you're asking about Rich's whip you obviously haven't read my blog a while. I would never touch anything remotely like that. I use only real, whole foods, not chemical laden garbage like non dairy creamer. The ice cream recipe will be posted in a few hours. Everything you made sounds delicious. I love to hear about your big shopping hauls and the resulting food. It's always so inspiring. I have tried a number of your recipes and enjoyed them. Love your blog!